Leon (Lee) Jones, MD has been appointed as associate dean for students, starting in September 2016. He will succeed Dr. Maxine Papadakis, who recently retired after serving our students and faculty for 17 years. 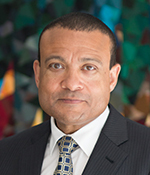 A board certified psychiatrist and nationally recognized expert in enhancing the learning environment for medical students, Dr. Jones joins UCSF from UC Davis, where he is currently the associate dean for student affairs. During his more than 25-year history in medical education, Dr. Jones has served as associate dean for students at three major universities. At every institution where he has served, Dr. Jones has been the recipient of numerous student-nominated awards and honors. Dr. Jones has taken critical national leadership roles to design and advance strategies that enhance the culture of equity and inclusion in all medical schools. He currently chairs the AAMC Group on Student Affairs National Steering Committee and the AAMC Task Force on redesign of the Medical Student Performance Evaluation (MSPE). An expert in holistic admissions, Dr. Jones has served as a national educator on medical education and Deferred Action for Childhood Arrivals (DACA), as well as for the Building the Next Generation of Academic Physicians diversity initiative. In addition, he has been an active participant in faculty and student educational initiatives designed to enhance care of LGBTQI patients, including the creation of a series of video interviews for the AAMC on the topic of Enhancing Institutional Culture and Climate for LGBT and DSD Populations. Dr. Jones was on the UCSF faculty previously from 1999-2005, when he held a number of positions in the Department of Psychiatry, including director of Intensive Services and director of the Psychiatric Consultation Liaison Service. His passion for medical education was evident as one of the five founding mentors of our Student Advisory Colleges. He also served as director of Graduate Medical Education, working with residents, fellows and faculty across all specialties. While at UCSF, he received numerous teaching awards from both students and residents and was inducted into the Academy of Medical Educators and AOA Honor Society. Dr. Jones received his BA from Dartmouth College and his MD from Columbia University College of Physicians and Surgeons. After completing a psychiatry residency and chief residency at UCLA Neuropsychiatric Institute, he entered a consultation-liaison fellowship at Memorial Sloan-Kettering Cancer Center in Manhattan, followed by a research fellowship at UCSD focusing on the interactions between the CNS and peripheral immune system. Dr. Carol Miller has served as interim associate dean for students during the transition period.